Restaurants and other service industries have one chance to make a good impression, and once the customer is inside the door, it is the formal uniforms of the staff that speak volumes. Let the elegant appearance of your staff give your customers a hint at what is to come: seriousness of purpose, attention to details, and propensity for professionalism above all else. Formal uniforms are never meant to be the focal point of an event; food, drink, and atmosphere should always take center stage. But the key to highlighting those things is an impeccably dressed and trained server. Should service be invisible as we've been taught? We don't think so, but we do believe that a positive experience with a server will lead a customer into a positive experience overall. While a meal or the ambiance of a restaurant may be the take-away for the evening, how the server presents these things will frame the experience. So we believe it is imperative that attention be paid to even the slightest detail of the formal uniform. There are several components to the formal uniform, and each component is just as important as the next. Begin with a shirt; simple collar or wing-tip tuxedo collar? The choice is yours. A bowtie (either pre-tied or self-tie) can be worn with either and can add just that much extra elegance to the attire. For a crisp, well-tailored look, consider a vest. Colors and different textures to match a bowtie give a team of servers an impressive air and communicate confidence and competence. Perhaps you'd like a formal uniform without the vest – we highly recommend the bowtie and cummerbund duo. This gives the servers the air of formality without the added warmth of a vest, which was exactly why it was adopted by British military in India instead of waistcoats. You know your servers are working hard, so it might be a good consideration to opt for the lighter-weight uniform while still maintaining the formal look. Before your customers are sipping a drink at the bar or perusing the buffet, they can learn about your business just by the formal uniforms of your service team. 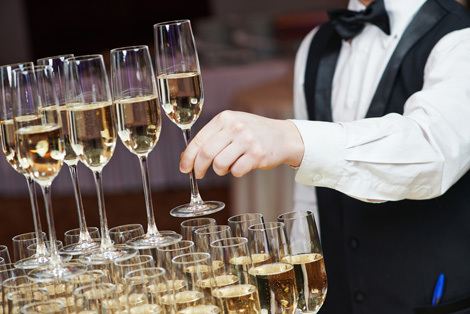 Whether in a restaurant, a catered setting, or some other service industry, formal uniforms tell your customers that you are serious about providing the best possible service for them and that they can expect only the best experience. Krisar Clothing is just a click away, ready to help you and your service team on your way to a 5-star look at a 2-star price.